I’m taking a few days break, and am having a long weekend away from the blog. I’m sure stories will come from it, but in the meantime, here’s a shot of a fallen tree I took a couple of weeks ago in the grounds of Blickling House in Norfolk. The roots upended from the ground have been weathered and smoothed and have created fascinating planes and angles. Last week at the Blickling Estate in Norfolk, the gardens were in their end of winter, pre Spring phase of being basically bare. In one corner, where the snowdrops were already fat and prolific, there was also several Hellebore’s in flower. Small herbaceous perennials, the flowers tend to droop towards the ground rather than turning their faces to the sun. How Secret is the ‘Secret Garden’? I know, I know. When you go around a stately home, you’re meant to admire the draperies, the wallpaper and the paintings upstairs and the brass pots and pans downstairs. This last weekend, while I did plenty of that, as well as craning my neck to see elaborate stucco ceilings and stained glass windows, I was also struck by some of the things on display as interesting ‘antique’ curios which we still have in use in our family home, as well as this sign. Is it possible to signpost a secret garden and for it to remain secret? By the act of pointing it out to all comers, is the National Trust not depriving it of its secret status? Or am I taking this too seriously? And what about the Sitooterie? It is indeed an area in the garden designed for sitting out it- a bench beneath the trained branches of a tree. A fairly recent addition to the gardens at Blickling Hall to keep everyone interested, at least the sign entertained me. I’ve enjoyed reading the definitions of ‘delicate’, the photo prompt for this week especially after looking at the picture which accompanied the prompt itself, a particularly noxious looking combination of green leaves and pink grapefruit segments doused in oil; ‘delicate’ would have been the last word I would have used to describe it. Maybe my understanding of the word diverges from the common usage….. I am reassured that my Oxford English Dictionary has confirmed my view. It is fine in texture, soft, slender, slight, of exquisite workmanship, and (of food) dainty and palatable, (or colour) subdued or subtle; easily injured, ticklish, deft and avoiding the offensive or immodest. So, not a word easily associated with grapefruit under any circumstances. So instead, I offer you seaside grasses by sunset. They are soft and slender, so might qualify as delicate, even if they are not fragile, bending as they do to withstand the wind spreading their seed to continue for the next season. It’s all in a delicate balance. Ailsa has suggested ‘mystical’ as a prompt for a travel photograph this week. It is a word that sent me to the dictionary, as I had a feeling that it is one for which the meaning has subtly changed in recent years. My Concise Oxford dates from 1976, when I received it for Christmas, so I knew would give me a base definition against which to test my supposition. For mystical, its definition is ‘of mystics or mysticism; having direct spiritual significance’. As an adjective it denotes spiritually allegorical or symbolic; occult, esoteric, or of hidden meaning. A mystic, is one who seeks by contemplation and self surrender to obtain union with or absorption into the Deity, or who believes in spiritual apprehension of truths beyond the understanding. Hence mysticism (often derogatory). For some reason, I like that ‘often derogatory’. There is little mention of the mysterious or atmospheric with which we might associate the word today, although the allegorical, occult or the idea of hidden meaning, gives a hint of the trend in usage. Focusing on the idea of spirituality, here is a head in St Margaret’s church in the grounds of Felbrigg Hall in Norfolk. I don’t know who it is or why it’s on the wall in the church, but there is something satisfying about the simple lines and the smooth shapes, even if his flat head might only be for resting a candle on. Rereading ‘one who believes in spiritual apprehension of truths beyond understanding‘ has a certain unexpected synchronicity in the wake of the discriminatory decision by the Church of England yesterday not to allow women to become bishops. Mysticism in action? Green, the perfect opportunity to use some of the photos I took last week in Norfolk, as even though the autumn colours are already fading, there were still plenty of patches of green to catch they eye. The flint walls are in Cley next the sea, as are the marshy grasslands. The other shots are from around the grounds of Felbrigg Hall. Sometimes only a photo of a windmill at sunset will do. It’s in Norfolk, Cley next the sea; it was about 4:30 in the afternoon at the end of a windy walk along the coast. It’ll do. Last week on my visit to Felbrigg Hall in North Norfolk, we walked around the gardens and woodland, and by happenstance came through the Victory V path, a beautiful arrangement of trees planted to commemorate VE Day, and in memory of his brother by the Squire, Robert Wyndham Ketton-Cremer in the late 1940s. On a sunny November afternoon it was the perfect combination of autumnal colours, of russets, greens, browns and orange. There was satisfaction in kicking through the leaves underfoot and in remarking on the enduring nature of the memorial built into the landscape which retains the power to make one pause to both admire its symmetry and the work that went into its creation. I’m visiting the Norfolk coast for the first time; and without internet, so this will either appear several times or not at all. 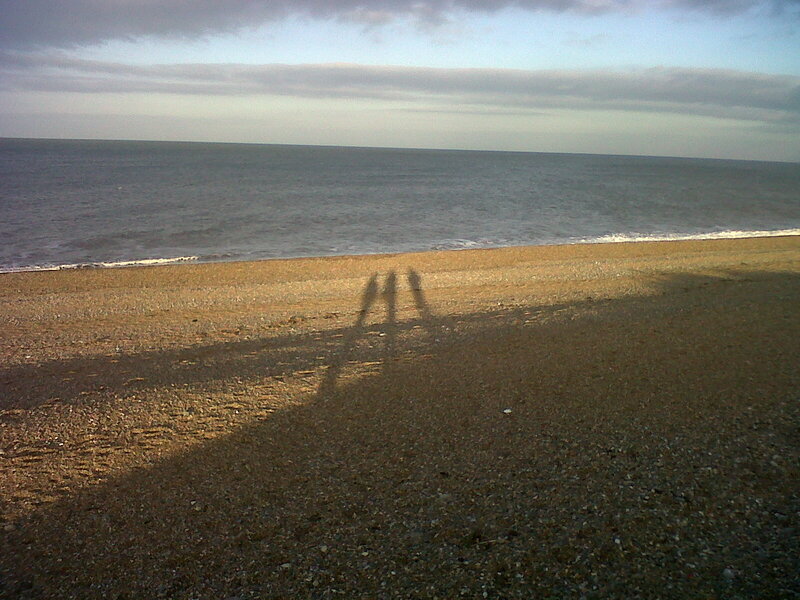 This was a beautiful walk near Clay as the winter sun was already low in the sky casting our shadows long towards the sea. Normal service will be resumed shortly…..